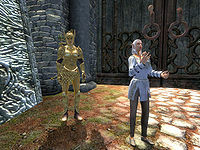 Thaedil is a Bosmer acrobat and juggler living in Bliss, New Sheoth. Her insanity seems to be that she is bipolar. Half of the time, when you speak to her, she is happy and pleased with herself. The other half, she regrets ever becoming a juggler, lamenting her status as the "worst juggler in the world". Her ever-changing confidence and constant mood swings never prevent her from venturing outside to demonstrate her juggling skills to the other citizens of Bliss. She lives in the southwestern corner of Bliss and sleeps there every night between 10pm and 6am. After eating a two-hour breakfast on the ground floor, she heads outside at 8am and spends nearly all day wandering around town, at random times juggling in front of the many townsfolk passing by. Her favorite spots includes the plaza and alleyways near The Missing Pauldron, the area in front of the southern gate and even outside the northwestern gate, where a lonely Golden Saint Guard is her only audience. She pauses at 12pm for a two-hour lunch at The Choosy Beggar and heads back home for a two-hour dinner at 8pm. She wears a simple set of Mania clothing, a pair of brown trousers with loafers and a grey tunic. She carries around her house key, a bread loaf and a leveled amount of gold. When you meet her for the first time, her irresoluteness shines through: "Have you caught my act yet? I'm Thaedil, the juggler. I'm sure you've heard of me. Oh, who am I kidding? More likely you came to scoff at the worst juggler in the world." On subsequent meetings, she will give you different greetings, all depending on her mood: "Did you see that? Twelve balls in the air at once! No one has EVER juggled that many at once. ", "Is there anything more pathetic than a clumsy juggler? Don't even look at me! ", "Don't be shy. I'm really very approachable. You wanted an autograph, is that it? ", "I'm awful. Just awful! Why I became a juggler I'll never know. My mother pushed me into it. ", "Once I've perfected my act, I'll be the toast of the Realm!" and "You saw my last show, and came to mock me, right? Don't worry, I already know. I disgust myself." When ending the conversation she will say: "I'd better get back to practicing." After the main quest is completed, she will greet you differently: "Lord Sheogorath! I would love to put on a show for you some time." and "Can I show you my latest trick, Lord Sheogorath?" The citizens of Bliss seems to be divided as well. As an artist, Thaedil regularly asks them for feedback: "Did you see my last performance? Did you like it?" and will receive the following answers : "Do you call that juggling? You should be ashamed of yourself. ", "It was wonderful! Your show was amazing! ", "Shockingly awful, if you really want to know. Worst I've ever seen." and "Oh, I loved it! Best I've ever seen. You're one of the Realm's greatest artists, if you ask me." There's someone new in town, I hear. Finally, someone with a wider perspective who can appreciate my art! I wonder... now that the Gatekeeper is dead, perhaps my fame will finally spread far beyond the Shivering Isles! I'm calling my new act "The Restoration of the Resonator." But, I don't think my public is ready for it yet. It's very cutting edge. Syl has gone on another one of her rampages in Crucible. I'm certainly glad I live on the right side of the wall. I'm working on a very unusual new juggling routine to commemorate the relighting of the Torch. But you'd probably hate it. I wonder if the new Duke of Dementia is a patron of the arts. Perhaps he will be more appreciative of my act than Lady Syl. I'm so excited! I expect an invitation to perform at the installation of the new ruler of Mania any day now! During these terrible times, I think people need juggling more than ever to take their minds off their troubles. I'm working on a new act where I juggle arms and legs -- in honor of the new Gatekeeper, you see. I'll soon be unveiling an entirely new act. "Silence Over Brellach: A Juggling Epic." I think you'll agree it's my finest work. All my patrons keep disappearing! It's impossible to create important art under these conditions! Art has triumphed! I plan to dedicate my next juggling epic to Sheogorath's glorious victory! 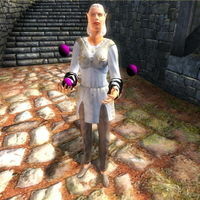 The purple color of her juggling balls is achieved by a missing texture; when a texture is missing, the game replaces it with solid purple to make it stand out. This issue has been addressed by version 1.0.0 of the Unofficial Shivering Isles Patch; A new texture has been provided for the balls. This can be seen on Thaedil's image above. A strange error found when talking to her is her voice acting, which differs from the subtitles. When the subtitles read, "Did you see that? Twelve balls in the air at once! No one has EVER juggled that many at once." She actually says, "Did you see that? Three plates in the air at once! No one has EVER juggled that many at once." This bug is fixed by version 1.1.0 of the Unofficial Shivering Isles Patch.